Design trends keep evolving and changing. That which is currently appealing will not be next year, thanks to the constant development in science and technology. Every consumer wants a new experience, something refreshing and with technology playing an active role in everyone’s lives, UI has never been more important. Here is a list of the current UI Design Trends. Typography has always been significant when it comes to UI but this year’s trend is to make it bold and beautiful! Big, bold and catchy fonts make the content meaningful and impart a great UI experience. Large fonts help in enhancing readability, which is the primary reason for content. With the right font, the mood gets transferred to the reader enveloping them in the total UI experience of a website or application. Plus, it’s always fun to try out various fonts! There are many different choices for this but we are focusing on three: Monochrome, Pop and Vintage and all three are rocking it big time. While vintage was and is in vogue, monochrome seems to be getting the spotlight as it plays well with bold typography. Vintage has always been the go-to design to impart a timeless and classic feel and we doubt it will stop being in trend anytime soon. Monochrome sets a more minimalistic tone of voice for the user keeping the look and feel, simple and neat. Pop colours seem to have caught on as it is more fun and quirky and appeals to the younger generation; also because not all websites have to be serious. The current logo trends employ these choices of design. Illustrations are the most important part of UI as they will have to grab the attention of the reader and make them stay a little longer on the website or application. With displays getting better colour contrast ratios, designing the right illustration for a website or application has never been more crucial. Abstract illusions are currently trending as it draws out the creativity of the designer and has plenty of room to experiment on. This enables the designer to bring out the most appropriate look and feel for the website or application. Illustrations can either take over the entire webpage or use a part of it. Since illustrations are perceived faster than the content, if done correctly, the theme of the website or application can be portrayed aptly. Animations are a testimony to how much and how fast designing has developed over the last few years. There are so many effects and animations that one can provide for any illustration to give it life, style and to maybe even deliver a story. Animation makes the UI a fun, energetic and interesting place drawing more viewers to it. Animations make the UI more memorable and give it a unique personality to linger in the minds of the user, long after they leave the website or application. The most trending animation is the Glitch animation that makes it look like there’s an interception in the signal and social media platforms like Facebook have their own glitch filter. Another famous UI animation that’s making the rounds is Micro Interactions and they are pleasant and easy on the eye. Adding Background music and sounds are the latest trend in UI. Imagine a picturesque view of the beach on a windy day with the sounds of the breeze and the waves as they hit the beach. What would you say if we told you that this could be achieved in your displays in this current age and time? A variety of sounds can be added to a website or application and it activates as soon as you open it. This takes the UI look and feel to a whole new dimension. It awakens your sense of the hearing and takes you on a journey through the website or application giving you an amusing and entertaining UI experience. All this joined together gives the user a UI like never before! Good designers all over the world stay up-to-date and excel in these latest trends to give the clients something fresh and new to see and be a part of, that wasn’t available in the previous years. 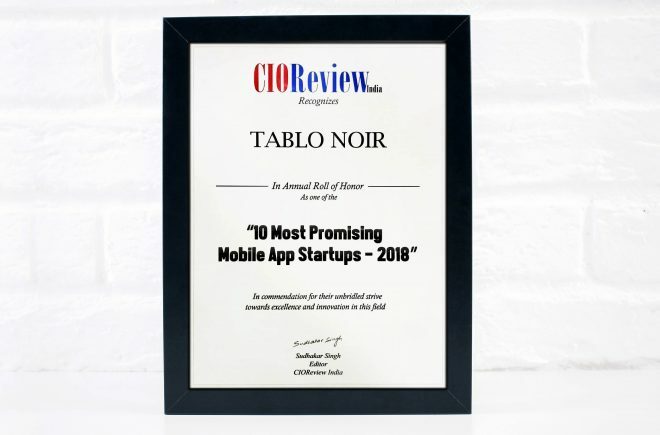 Visit us at Tablo Noir to get yourself a UI that is unique and has a personality of its own.